In the inventories of the Observatory it is described as a Diffraction grating spectroscope with circle, collimator and telescope; it was bought in February 1884 at a cost of £. 352. In the 1890 inventory it is listed as Spectroscope mounting – diffraction-grating returned; a copy of the same inventory bears an annotation in Riccò’s handwriting: The diffraction plate is a gift from Prof. Tacchini. The instrument is made of brass with burnished parts; its overall length, including the right-angle telescope, is about 60 cm. The tube bearing the slit and the collimator is 28 cm long, has a 5 cm diameter and is equipped with the usual screw to adjust the width of the slit. On the side of the slit it is connected to a collar, of 15 cm diameter, which rotates by means of a screw. On the collar it is engraved a circular scale, in silvered metal, numbered every 30° segment. Two needles made of burnished metal, diametrically opposed and fixed to the main tube, allow the position of the prominences observed on the solar limb to be determined. The small telescope is approximately 3.5 cm in aperture and its maximum protrusion from the tube is 10.5 cm. A steel burnished armor connects the main tube to a burnished metal cylindrical box, 6 cm high and with a 9 cm diameter, with a screw for sliding the side door. The box housed the diffraction grating, now missing. 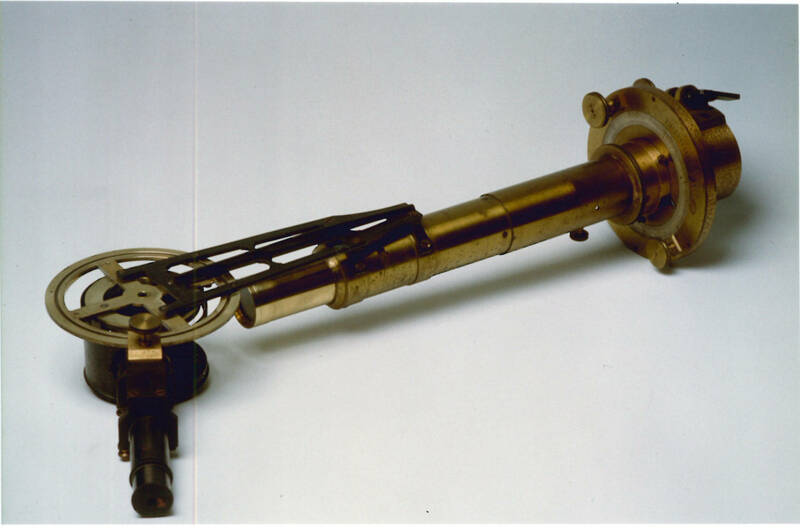 The small 16-cm long telescope is connected through special supports to a metal plate which rotates, by a screw, around the lateral opening of the box, along a circular track. Bibl. : Foderà Serio, Chinnici 1997, p. 133; Chinnici 2000.